You would think that we all know our own place wouldn't you. As a well educated , well travelled Scotsman I like to think that I know my own country pretty comprehensively. Growing up as I did in the fifties and early sixties I was lucky enough to have parents who had a car, still a novelty then, and who liked to travel, albeit within Scotland. Long before I was a teenager I had been from Berwick to Brora, Gretna to Grantown, Auchtermuchty to Auchenshoogle. This fostered a natural sense of inquisitiveness that has never left me, I like to ferret about in detail, looking and learning whenever I can. The down side is that I can sometimes spend too much time visiting and re-visiting the same favoured locations, simply because I prefer to look at them again, rather than waste my time going to somewhere I have already been but which I considered rather dull the first time. It then comes as something of a shock to discover a chunk of your own back yard that has been sitting there, patiently waiting for you for the last forty years, which you have never set foot in, but which is truly outstanding. How could I have missed it all these years? How come no one told me? Perhaps I just wasn't listening when they did tell me. As if to remind me, yet again, that I am still not as smart as I like to think I am, dear old Scotland has surprised me this weekend past with a number of firsts ... my first motorcycle outing with my brother when it hasn't rained on us, my first ever night in a B&B, my first ever Saturday night in Fort William, and my first ever trip to the wonderful Ardnamurchan and Moidart peninsulas. I am delighted, amazed and more than a little shamefaced that it has taken me so long to discover what is probably the most beautiful chunk of my own back yard that I have yet stumbled across. But Fort William! What a monumental bummer. Saturday evening, the weather is lovely, and the town is filling up with people promenading. Youngsters with nothing to do, elderly couples out from their hotels for a walk, groups of blokes, foreigners, families, hikers, bikers ... you name it there are all there. And all of them with precisely bugger all to do! Fort William should hang it's head in shame. It is the epicentre of the burgeoning Scottish tourist industry, it is surrounded by stunning scenery, it is a natural crossroads and touring centre. Does it capitalise on this? Does it hell! A few busy seedy pubs, lots of plastic hotels playing plastic theuchter music, two scrawny tartan tat shops, McSporrans Highland Burger Bar and Kebabhouse, Loch Linnhe cut off by a four lane by-pass, a brand new leisure complex built where no one can find it and not surprisingly as empty as a church yard, and the most commanding view in town given over to a vast car park. Unbelievable. What's worse is that the place is full of people just itching to spend money, but there is nothing worth eating, drinking or buying. Try complaining that there is nothing, and the response will no doubt be to point to all the attractions which I've just listed above. Suggest that they are all totally crap, and chances are you will get a bovine stare of incomprehension. Hasn't any one been to Switzerland, the Italian Lakes, Scandinavia, the French Alps? Can't they see the difference in quality between the absolute tat we offer in Scotland, and what our continental cousins enjoy. Fort William ought to stand comparison with Interlaken or Chamonix, after all it has just as a good a location. But even mentioning all three places in the same breath is a joke. It makes me embarrassed to be Scottish. But even Fort William couldn't spoil the Sunday morning that greeted us. Still air, blue sky, gentle warm sunshine glinting off Loch Linnhe. It was perfect. After a monster breakfast, we pulled out on the two bikes, and headed for the Corran Ferry. Brother was on the larger of the two bikes, and if you have never tried balancing 500lbs of someone else's expensive top-heavy pride and joy up a slippery steel ramp onto one of Cal-Macs tubs, with it's owner watching nervously, then you've missed one of life's more .. er .. delicate moments! But any missed heartbeats getting on and off the ferry were instantly dispelled by what I found next. I have crossed the Corran ferry once before and simply turned right to come back via the hideous pulp mill at Corpach. Brother had however spent a week in Resipole in a caravan a couple of years back in traditional driving rain, and wanted to see how it looked with visibility measured in miles not yards. Let me tell you it looked stunning. From the first few miles I realise that there is a subtlety about this area that I had not seen before. It has the grand scale of the more northern west coast; great bays, distant peaks, looming hills and all. But it has a softer side though which is unusual. It is as if the lushness of Perthshire had been mixed with the ruggedness of Wester Ross. I am conscious of large deciduous trees, oaks, chestnuts, maples and more. These have been planted very deliberately, and some are now centuries old and quite colossal. The mixture of man's influence and nature's beauty is nothing new, but here it takes on a form that has something very special, some tangent I haven't previously felt. The effect is breathtaking, at least it is for me on this particular quiet Sunday morning, swooping effortlessly along on deserted roads on a powerful bike. I am captivated. We pull into the delightful village of Strontian, and go into the village store, which has a welcome sign saying "Teas & Coffee Served", I am gasping for a cup of something. I approach the chap at the counter, noticing behind him a kettle and all the necessary ingredients for a cuppa. He is also holding a cup of coffee of his own. I ask if he is serving morning coffee, he eyes me up, and in a white settler's accent announces that he isn't. I could cheerfully strike the self important git, but I restrain myself and hope he chokes on his coffee. He then has the temerity to recommend a nearby tea-room ... gee thanks ya muppet! So even in the midst of this most toothsome of places, crass ignorance flourishes, in my mind's eye I can see him in his shell suit, climbing into his Lada and heading off to a car boot sale. Against my better judgement we travel the mile or so to the tea room he mentioned, as my brother has been there before and says it's good. I am not convinced, but what the hell, a chap can only be incensed so many times in one day. The tea room is called "Cozy Knits" and it is a revelation. A small new building, well hidden, it is half cafe, half knitwear factory and run by some of the nicest folk I've met in ages. We are provided with a large pot of delicious coffee, there are copious apologies that the home baking isn't quite ready, but if we wait 10 minutes the scones will be out of the oven then. You better believe that those 10 minutes were worth the wait, as we wolfed down a plate of red hot buttered scones with home-made rhubarb and ginger preserve. And all for a few pounds. I can't recommend this place highly enough. As I'm waiting for brother outside one of those typically Scottish things happen. A lady appears and starts admiring the two bikes, telling me about someone else she knows that has a BMW, and how secretly she would like to own one too. Nothing unusual here, these bikes attract this sort of casual conversation all the time. 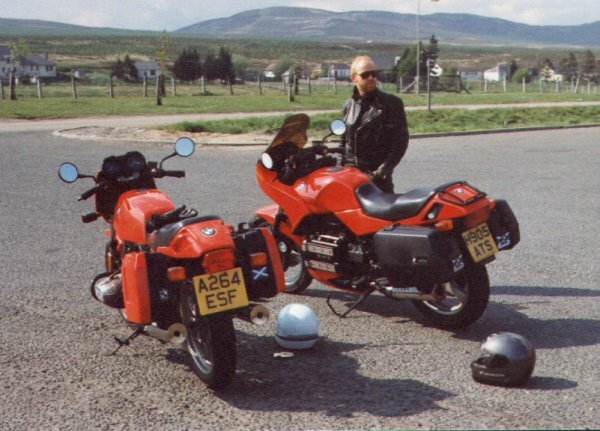 To me I only own these bikes because I happen to like them, and as a devotee of Honda's cars, I'm not always that impressed with BMW's engineering skills. Frankly Honda does a lot of things better, though somehow I just don't seem to get on with their bikes at all. But to non-bikers there is no doubt that that roundel brings out a whole different attitude. Somehow I doubt if two Kawasakis would have started this conversation. If nothing else people don't leap to the conclusion that you must be some sort of escaped pervert just 'cos you arrived on two wheels. I could well live without all these snobbish misconceptions, but it occasionally has it's uses so I just have to grin and bear it I guess. Brother arrives from his ablutions, and the talk turns to why we are visiting here. He explains that he spent a week here in a caravan some time ago, hired from a friend of a friend of a friend. It only takes another few conversational exchanges to establish that the lady we are talking to is the owner of said caravan, and as soon as the trail of mutual friends is trotted out and untangled we are all the greatest of pals. We are ushered back into the little restaurant to be re-introduced to the owner and all her family, who of course all have even more mutual acquaintances in common. Some total strangers who have just dropped in for a coffee join in the conversation just for the hell of it. Eventually we all make our goodbyes, with lots of promises to pass messages on to heaven only knows who, and promises to return soon and stay for a week next time. My spirits are restored. Scotland the village does it's stuff again. And so the rest of the day goes by, glorious weather, stunning view follows upon stunning view as I discover this magic little corner of my own back yard. All too soon it's over and our schedule presses us to head for home. This means a fairly sedate run down the busy and Police overkill A9, but not before we have a bit of a hooligan thrash down Loch Laggan and over the hill to Dalwhinnie, Scotlands most windswept and boring village. From here on the magic slowly leaks away as we near home, funny how this always happen to me whenever I come home from a good trip. But there is always next weekend ... which new bit could I uncover this time?